You know that CES 2011 saw Mattel introduce the Angry Birds game in the analog world – yup, that’s right, we now have Angry Birds in the real world where you will need to painstakingly stack up a bunch of wood, glass and stone pieces (they’re all made out of plastic actually, just differentiated by their texture and color), while stashing away the evil pigs before letting loose a torrent of Angry Birds. 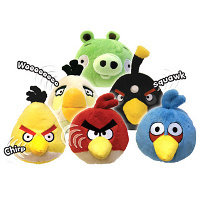 Well, things have taken on a softer stand now with the Angry Birds Mini Plush with Sound, which are pretty much self-explanatory in the first place. Available in white, blue, yellow, black, red and Piggy form factors, they retail for £4.99 a pop. They will chirp and oink (for the pig, obviously) each time you squeeze them, reinforcing further this cultural establishment of iPhone games in common consciousness. You can be sure that this will draw more attention than an actual parrot sitting on your shoulder!